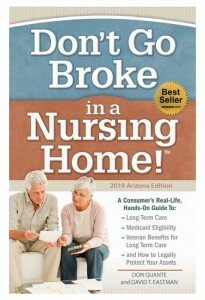 As eldercare replaces childcare as the number one issue facing Baby boomers Don't Go Broke in a Nursing Home is one book you need to take back control of your life and provide excellent long-term care for your aging loved ones with out them going broke in the process. When you still have time to plan ahead. Choosing the right preplanning strategy for your own long-term care needs is essential as our population ages. This book is full of creative financial strategies that you could use to protect your assets and the quality of care you receive. In addition you will learn about little known tax incentives available to those who plan ahead for long-term care. When there is no time to plan ahead. Knowing how to effectively care for your aging parent or loved one will save you time, energy and money. Learn the secrets that make care giving easier including how to choose the right home care providers, long-term care facilities and how to manage the crisis. In this book you will learn the legal strategies and government benefits available that can help your aging parent who is in a crisis pay for long-term care with out going broke in the process. If you loved one is a qualifying veteran, you will learn the strategies to help them receive up to $25,020 each year tax-free to pay for long-term care.